Man, I hate it when my blog gets hacked by clones! (Scroll to the previous post if you don't know what I'm talking about) That was pretty cool seeing the Podiobook author (something I plan on being) J.C. Hutchins release his first print edition novel through St Martin's Press: 7th Son Book One Descent<-listen to it on podiobooks.com for free (warning lots of language, rated R). He put his book out for free as a podiobook back in 2006, built up a bunch of fans through a good story and sheer genius marketing, and he found a publisher for his book! Amazing. Yesterday he had fans let one of his fictional computer hacker characters hack into their blogs and twitter accounts. It was really fun, and a great way to spread the word about his print release. Anyways, I'm doing Nanowrimo this year for the first time! 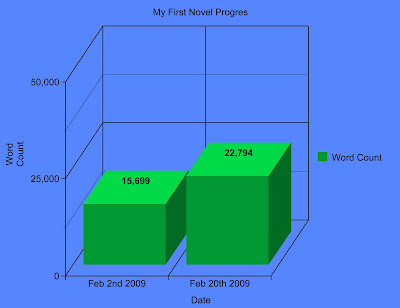 What is Nanowrimo you ask? 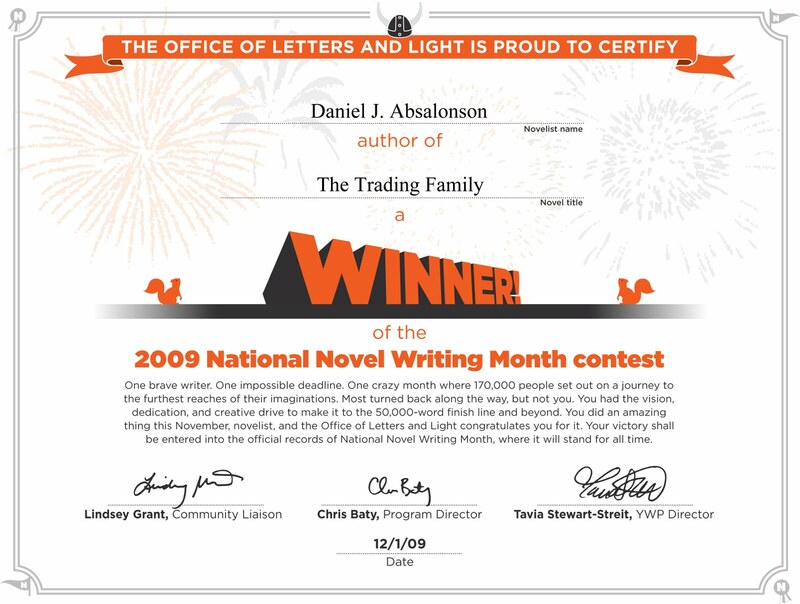 It stands for National Novel Writing Month. 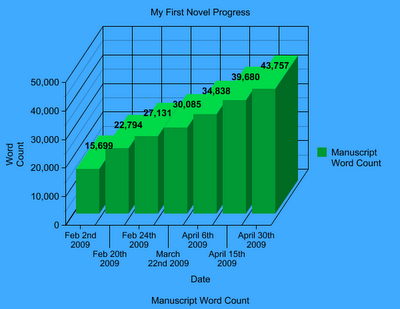 That's right, the goal is to write a 50K novel in the month of November. 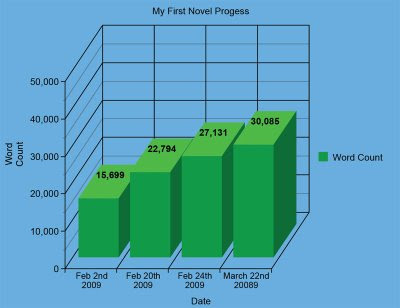 I don't think I'll be able to get 50,000 words in 30 days, but I'm sure I'll have over half of a novel written, which will be so awesome! If you're doing Nano too, I'd love to be your writing buddy, so click here My Nanowrimo Page and add me. Wish me luck, I've got quite a bit of the outline done so I should be ready to go this Sunday when November is officially here! 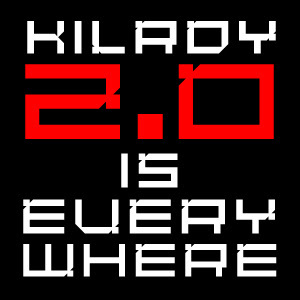 CONTENT OVERRIDE: KILROY2.0 IS HERE!!! the post you are now reading is designed to dull your senses to THE TRUTH. do not live the life of the worker bee, the cog, the well-oiled piston in the MACHINE OF DECEIT! there is a grand CONSPIRACY afoot. you have been taught to believe that you are UNIQUE, one of a kind. THIS IS NOT TRUE. long ago, a cabal of scientists created technologies to ensure that ANYONE'S MIND AND BODY can be duplicated. If you're like me, you can't find enough time to read. I have a question for you, do you have anytime where you could listen to some fiction? I have a 45 minute commute to work each day, but it's enjoyable because I've got a whole bunch of audiobooks, and podiobooks to listen to. What is a podiobook you ask? If you know what a podcast is, then you can see, a podiobook is simply someone podcasting thier book, or a podcast audiobook. One great thing about podiobooks is, they're free! I'll recommend some good ones in this post, but back to my little story here. I consume at least one book every two weeks. That's right, and no, I don't have time to sit and read, ever. Any scrap of free time I can scavenge up, I use to write. So I challenge you, give it a try. Go and get a podiobook, and see if you don't get hooked. Or if you want to go and buy a traditional audio book, the two audiobook narrator's I highly recommend: Frank Muller, and Scott Brick. The narrator makes or breaks if an audiobook is any good, trust me. If you're looking for traditional audiobooks for free download, I suggest Project Gutenberg, although be careful, because a lot of the books there are read by volunteers, which is great, but you get different readers throughout the book instead of one narrator, and some of them are bad readers, or they don't have the best sound recording set up so the quality isn't always great. However, there are some great audiobooks there. They're free because they're all books that have gone into the public domain, meaning their copyright has expired. I highly recommend The Adventures of Sherlock Holmes. I've given you a direct link to the page with the amazing narrator. For some reason, they also have a version of this book with volunteers reading it, but I don't know why when they already have such a great version up. Oh well, to each his own. 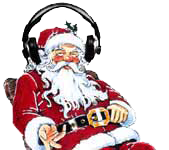 Tell me if you don't get hooked on consuming fiction through audio! I would love any comments you have. I added another 2,000 words, last night. This is the third story I've written that I know I'll complete. I feel like the first draft is a bit more polished than it was on my first two stories. This is very encouraging to me, I think I've learned some things, and it seems they're beginning to show in my work! Wrote about 1,000 words today, it felt good. 5,000 feels better, but you take what you can get. I would love for you to read a short story I wrote, and leave comments. ALMOST IN TO ACT III OF THE STORY! 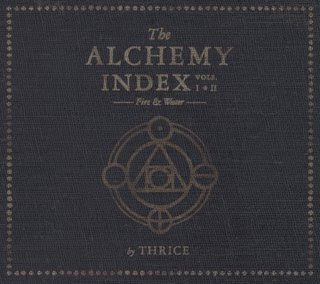 You should listen to The Alchemy Index: Vol. II Water by Thrice while reading 20,000 Leagues Under The Sea, they go very well together. 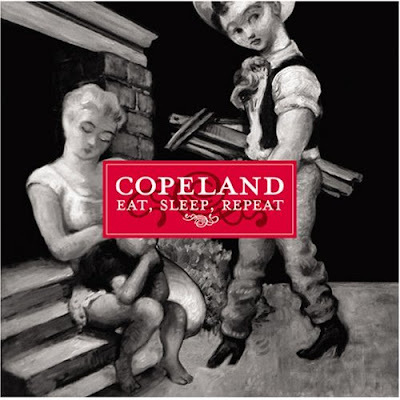 It is like a perfect soundtrack to the novel. 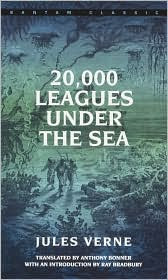 You could also read Treasure Island by Robert Louis Stevenson while listening to this album, as they share some themes, but 20,000 Leagues Under the Sea and the Thrice album have the same tone, and so go very well together. They have much of the same somber feeling. You can feel the quiet wonder of the unending sea, and the massive world that lies beneath it. 1. "...said uncle Pumblechook, a large hard-breathing middle-aged slow man, with a mouth like a fish, dull staring eyes, and sandy hair standing upright on his head, so that he looked as if he had just been all but choked, and had that moment come to." 2. "...with a bowl of battered small coins before her, as much defaced and beaten out of their original impress as the small coinage of humanity from whose ragged pockets they had come." "Valley View Cemetery, that gray-and-green island of tombs and trees and flowered paths a restful, leafy, whispering oasis lying like a cool piece of cloud shade on the luminous wheat plains north of town." "Hickock's uneven eyes turned towards the visiting room; his face, puffy, pallid as a funeral lily, gleamed in the weak winter sunshine filtering through the bar-shrouded glass." 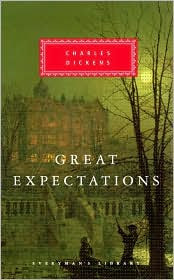 "We felt meditative, and fit for nothing but placid staring. The day was ending in a serenity of still and exquisite brilliance. The water shone pacifically; the sky, without a speck, was a benign immensity of unstained light; the very mist on the Essex marshes was like a gauzy and radiant fabric, hung from the wooded rises inland, and draping the low shores in diaphanous folds." This is a four stage editing process I've come up with. I've thrown in advice I've gathered from reading books on writing, and listening to writing podcasts. I kind of broke it down into 4 phases to go through, starting broad, and then narrowing down. You could almost say you start with revision, and then get down into editing. I hope it is helpful to you. Read it out loud, you'll catch things you wouldn't be simply reading through it. Protagonist go through a change? Character Arc? Each scene, character moving the story forward? Anything boring, or slowing the story down? Challenges have a strong enough conflict? Any fluff that’s not adding to the story? Kill your darlings! Break story into individual scenes, treating each scene as it's own story, does it work? Characters acting believably to who they are? Work from the last sentence to the first sentence in the last paragraph, read sentence to sentence then the full paragraph, all the way to the beginning. Spell check has been run. "It's" and "its" have been used correctly ("it's" is a contraction for "it is"; "its" is possessive). Any run-ons or fragments are intentional (and even those are rare). Subjects and verbs agree in number, and verb tenses are consistent throughout. Commas have been used correctly. "That" and "which" have been used correctly. There are no unclear or confusing pronoun references. Basic facts have been checked (especially ones that would be embarrassing to get wrong). Don’t get offended, use feedback, and thank them for it, they read it! 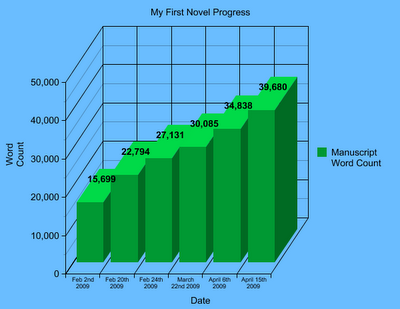 My First Manuscript Wordcount Update! Working through the middle of the story! 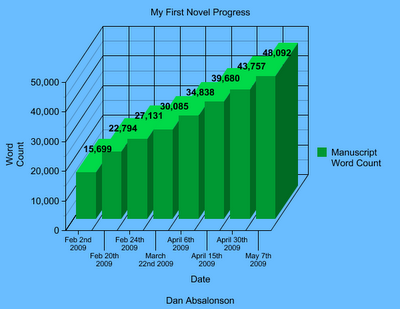 So, when you hit 50,000 words, it's considered a novel. 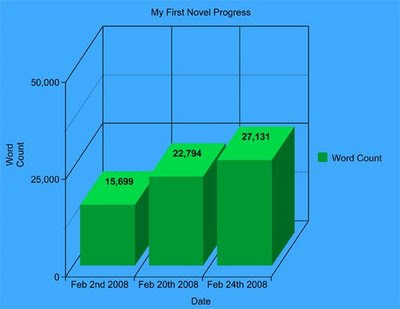 I'm guessing my first completed manuscript will be more like 25,000. 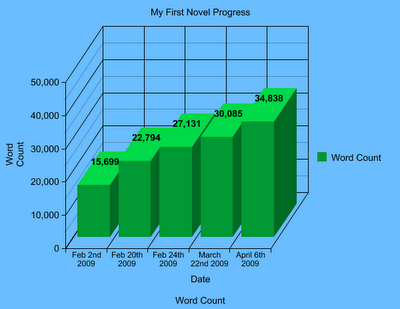 If I can get past 20,000 it'll be a Novella, like Hemmingway's The Old Man and the Sea. 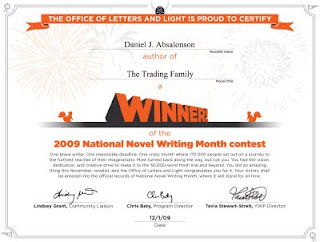 That's my goal, to pass up 20,000 words, but we'll see if my story needs to be that long.